References: 1. Willems F, Boers G, Blom H, Aengevaeren W, Verheugt F. Pharmacokineticstudy on the utilisation of 5-methyltetrahydrofolate and folic acid in patients with coronary artery disease. Br J Pharmacol. 2004; 141:825–830. 2. Lamers Y, Prinz-Langenohl R, Bramswig S, Pietrzik K. Redblood cell folate concentrations increase more after supplementation with [6S]-5-methyltetrahydrofolate than with folic acid in women of childbearing age. Am J Clin Nutr. 2006; 84:156–61. 93 3. Pietrzik K Lynn Shane B, et al. 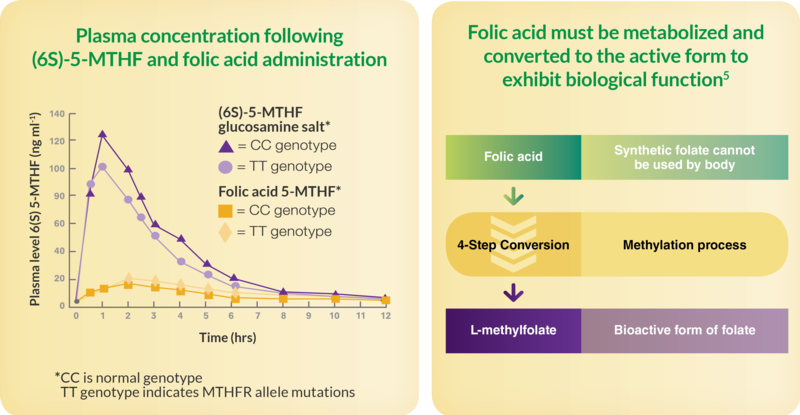 Folic Acid and L-5-Methyltetrahydrofolate Comparison of Clinical Pharmacokinetics and Pharmacodynamics. Clin Pharmokinet. 2010: 49 (8): 636-5<18. 4. Rader JI, Schneeman BO. Prevalence of Neural Tube Defects, Folate Status, and Folate Fortification of Enriched Cereal-Grain Products in the United States. Pediatrics. 2006; 117(4);1394-1399. 5. Scholl TO, Johnson WG. Folic acid: influence on the outcome of pregnancy. Am J Clin Nutr. 2000; 71(Suppl):1295S–1303S. 6. Unfried G, Griesmacher A, Weismueller W, Nagele F, Huber JC, Tempfer CB. The C677T poly¬morphism of the methylenetetrahydrofolate reductase gene and idiopathic recurrent miscarriage. Obstet Gynecol. 2002; 99(4):614-619. 7. Schmidt RJ, Tancredi DJ, Ozonoff S, et al. Maternal periconceptional folic acid intake and risk of autism spectrum disorders and developmental delay in the CHARGE (Childhood Autism Risks from Genetics and Environment) case-control study. Am J Clin Nutr. 2012; 96:80–89 8. Scholl TO, Johnson WG. Folic acid: influence on the outcome of pregnancy. Am J Clin Nutr. 2000; 71(suppl):1295S–303S.